The Custom Completer example shows how to provide string-completion facilities for an input widget based on data provided by a model. 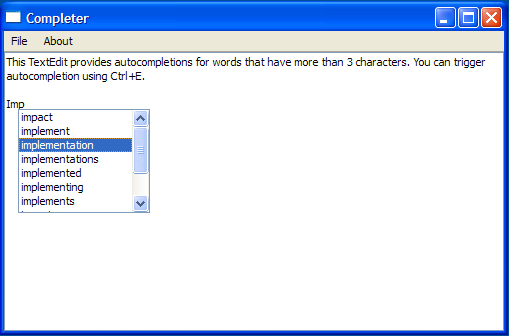 The completer pops up suggestions for possible words based on the first three characters input by the user and the user's choice of word is inserted into the TextEdit using QTextCursor. The TextEdit class is a subclass of QTextEdit with a custom insertCompletion() slot and it reimplements the keyPressEvent() and the focusInEvent() functions. TextEdit also contains a private function textUnderCursor() and a private instance of QCompleter, c.
The constructor for TextEdit constructs a TextEdit with a parent and initializes c. The instructions to use the completer is displayed on the TextEdit object, using the setPlainText() function. The setCompleter() function accepts a completer and sets it up. We use if (c) to check if c has been initialized. If it has been initialized, the QObject::disconnect() function is invoked to disconnect the signal from the slot. This is to ensure that no previous completer object is still connected to the slot. We then instantiate c with completer and set it as TextEdit's widget. The completion mode and case sensitivity are also set and then we connect the activated() signal to the insertCompletion() slot. The completer() function is a getter function that returns c.
The completer pops up the options available, based on the contents of wordlist.txt, but the text cursor is responsible for filling in the missing characters, according to the user's choice of word. Suppose the user inputs "ACT" and accepts the completer's suggestion of "ACTUAL". The completion string is then sent to insertCompletion() by the completer's activated() signal. The insertCompletion() function is responsible for completing the word using a QTextCursor object, tc. It validates to ensure that the completer's widget is TextEdit before using tc to insert the extra characters to complete the word. The difference between these two values is extra, which is 3. This means that the last three characters from the right, "U", "A", and "L", will be inserted by tc. The textUnderCursor() function uses a QTextCursor, tc, to select a word under the cursor and return it. The TextEdit class reimplements focusInEvent() function, which is an event handler used to receive keyboard focus events for the widget. The keyPressEvent() is reimplemented to ignore key events like Qt::Key_Enter, Qt::Key_Return, Qt::Key_Escape, Qt::Key_Tab, and Qt::Key_Backtab so the completer can handle them. If there is an active completer, we cannot process the shortcut, Ctrl+E. We also handle other modifiers and shortcuts for which we do not want the completer to respond to. Finally, we pop up the completer. The MainWindow class is a subclass of QMainWindow and implements a private slot, about(). This class also has two private functions, createMenu() and modelFromFile() as well as private instances of QCompleter and TextEdit. The constructor constructs a MainWindow with a parent and initializes the completer. It also instantiates a TextEdit and sets its completer. A QStringListModel, obtained from modelFromFile(), is used to populate the completer. The MainWindow's central widget is set to TextEdit and its size is set to 500 x 300. The createMenu() function creates the necessary QAction objects needed for the "File" and "Help" menu and their triggered() signals are connected to the quit(), about(), and aboutQt() slots respectively. The modelFromFile() function accepts a fileName and attempts to extract the contents of this file into a QStringListModel. We display the Qt::WaitCursor when we are populating the QStringList, words, and restore the mouse cursor when we are done. The about() function provides a brief description about the Custom Completer example.